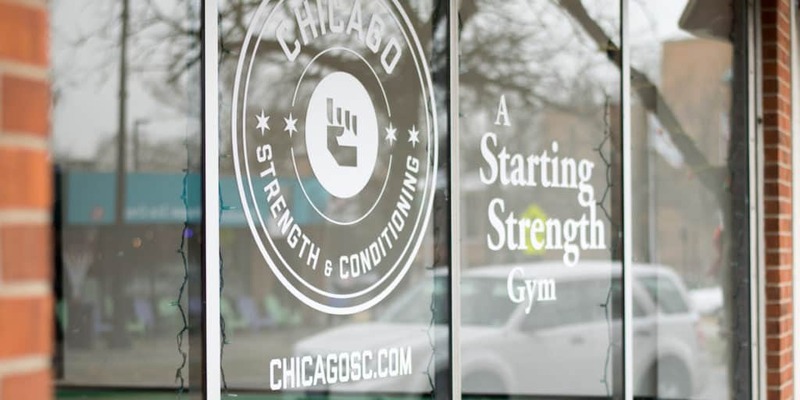 Chicago Strength & Conditioning is a community of lifters and coaches that specialize in barbell training in private and small group sessions. We are located in the heart of the Edgebrook neighborhood of Chicago. These three words are the Chicago Strength & Conditioning slogan and our goal for every single one of our members. We are not just a gym, but a community. A community of “ordinary” adults, who are anything but. We specialize in taking a simple instrument, the barbell, and using it to squat, press, and deadlift our way to stronger, happier, and healthier versions of ourselves. What do we mean by happy? This isn’t, “I just saw a cute cat video on Facebook,” happy. This isn’t, “It’s Friday and I don’t have to think about my job until Monday,” happy. Building strength and overcoming fears, doubts, and uncertainty has a profound effect on your outlook on life. Your stresses become trivialities. You stand taller, you walk with confidence and you smile not because you should, but because you can’t help it. Bill, age 54, is happy because he lost 60 lb, can pick up over 300 lb, and he does it with a double hip replacement. Our members use the barbell to meet a variety of health goals. Sure, there are the old stand-bys: losing fat, building muscle. But often it’s something more specific than that. This year you feel just a little bit different: your back seized up while tying your shoe, the lawnmower feels like it doubled in weight, or you lost a step in your softball league. Strength training gives you a stronger back, makes lifting awkward objects easy, and keeps you competitive in your sport. Few things you can do have such a profound effect on your health as strength training. It treats depression, diabetes, metabolic syndrome, reverses sarcopenia and osteopenia (muscle and bone loss)… the list goes on. Unfortunately, it doesn’t help you fly, but we’re working on that. So, why strength? Because it always works. Yes, always. Disclaimer: results are typical. It doesn’t matter where you start. Some start with 95 lb., some with 45 lb., some with 15 lb. and some just sit down and stand back up. You will do something on day one, and two days later you will do a little more, and two days later a little more. We use three other little words to describe our methodology: simple, hard, and effective. We don’t want to “crush”, “trash”, “smash”, or “destroy” you. We’re not here to make you sweaty, tired, and sore. We’re here to make you Happy. Healthy. Strong. Want to hear more? Contact us below. If you want to read more, we recommend The Barbell Prescription: Strength Training for Life After 40 (Amazon).